Attorneys and staff from Reger Rizzo & Darnall joined with members from PECO/Exelon and the Homless Advocacy Project (HAP) to host a birth certificate clinic at PECO's corporate headquarters in Philadelphia. More than 60 volunteers from Reger Rizzo, PECO, HAP, and several other companies - including Wawa, Lincoln Financial, Subaru, Aetna, Aqua America, Verizon and more - assisted more than 240 adults and children to apply for their birth certificates free of charge. 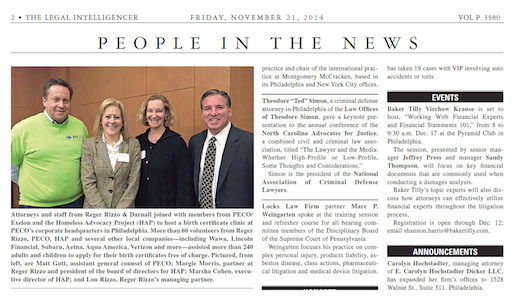 Pictured from left, are: Matt Gutt, Assistant General Counsel of PECO; Margie Morris, Partner at Reger Rizzo and President of the Board of Directors for HAP; Marsha Cohen, Executive Director of HAP; and Lou Rizzo, Reger Rizzo's Managing Partner.